Those of you who spent much time with our family in Georgia know how we love to have backyard parties to celebrate with friends. That is something we have really missed here. But today we hosted our first backyard party. We have been staying at a house here in Jinja since we arrived in early July. This house belongs to an American family and they were looking for someone to stay here while they were in the states. They also wanted their security guards and the woman who helps cook and clean to stay employed at the house. When we arrived we had people to help us right away as we learned how to cook here, had questions about culture or language, or needed to know where to buy things, what to pay, etc. These "employees" have become dear friends. When we think about leaving this house, what we will miss most is our friends here. We wanted to do something special to let them all know how much we appreciate them, so we decided to invite their families to a party to say thank you. They have fairly large families so it was a big party with about 40 people. Today they all came and we all had a wonderful time. We cooked 10 kilos of beef and 10 kilos of rice and 3 bunches of matoke and 5 heads of cabbage and some dodo(greens). We also bought chipatis and cokes and a cake. There was plenty of food for everyone and we were able to send them all home with some leftovers. After eating we had a time of sharing how we are thankful to God for them and how they have helped our family as we transitioned here. Then they also spoke and encouraged us greatly. 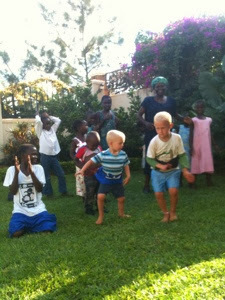 After the speeches it was time for races among the children, music and dancing. It cannot be a Ugandan event without music and dancing! Zeke and Ezra particularly enjoy the dancing. Our time together ended with several songs in praise to God and a time of all holding hands and praying. I am so thankful that I have such wonderful Ugandan brothers and sisters in Christ! Over these past several months God has shown his loving care for us through his family both here in Uganda and those of you in the US.